On Earth, the Mutanimals prepare to battle Maligna’s fully-grown children. As the battle begins, Screwloose explains how Maligna destroys planets: Her children eat the planet’s rain forests, converting them into carbon dioxide and chlorofluorocarbon gases which heat up the planet and destroy the ozone, allowing ultraviolet radiation to destroy plankton and crops, thus crippling the food chain (convoluted!). The Mutanimals aren’t about to let that happen and fight on. Back at the Hive World, Raph and Mondo are being basted in a paralyzing honey in order to make them more palatable to Queen Maligna. 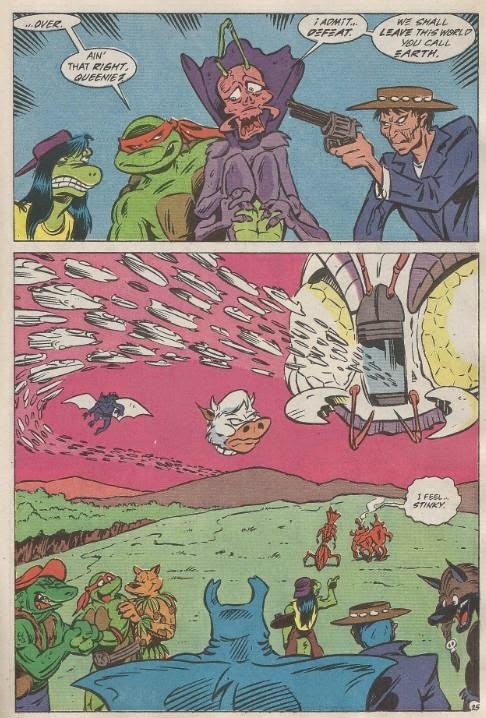 In South America, the Mutanimals continue to take down Maligna’s children with relative ease as Cudley transports the fallen warriors back to a safe place in Dimension X. As soon as they believe they’ve won, though, the Hive World touches down on Earth. With the power of her hive mind, Maligna unleashes thousands of war ships which begin attacking all over the world. The Mutanimals begin to lose hope, only to be attacked by Skul and Bean. The Mutanimals fight back, but find this pair of Malignoids to be far tougher than the others. Onboard the Hive World, Kid Terra makes his move. He shoots the two Malignoids holding Raph and Mondo hostage and helps them clean the paralyzing honey off of themselves. Outside, the fight against Skul and Bean remains at a stalemate. Skul requests that Bean launch another smoke bomb from the spout on his head. Bean complies, only to have the spout clogged by a well-aimed rock from Screwloose. The bomb explodes inside his head, rendering him unconscious. On the Hive World, Raph, Mondo and Kid Terra take Maligna by surprise. Kid Terra shoots off one of Maligna’s antennae which she uses to control the hive mind. Without it, her children become lost and defenseless. Maligna surrenders and orders all of her children back to the Hive World. Outside, Leatherhead puts the finishing touches on Skul. Raph, Mondo and Kid Terra then teleport over to their location and force Maligna to admit defeat, making her promise to leave Earth. As Maligna leaves with the Hive World, however, she vows to return for vengeance some day. Later that night, Kid Terra asks Man Ray for forgiveness for accidentally killing Bubbla. Man Ray says nothing and turns his back Terra. Just then, he notices several eyes watching him from the forest. They turn out to be cattle. 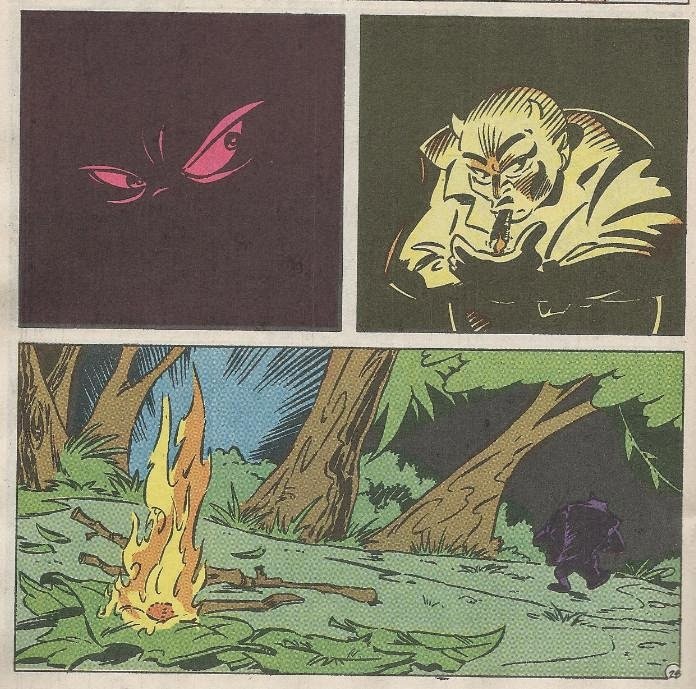 As the Mutanimals celebrate their victory by a campfire, a very unhappy Null lights up a cigar and marches off into the wilderness. Out in space, Stump, Sling, Tyme an Fayme thank everyone for watching. *This story is continued from Mighty Mutanimals (miniseries) #2. 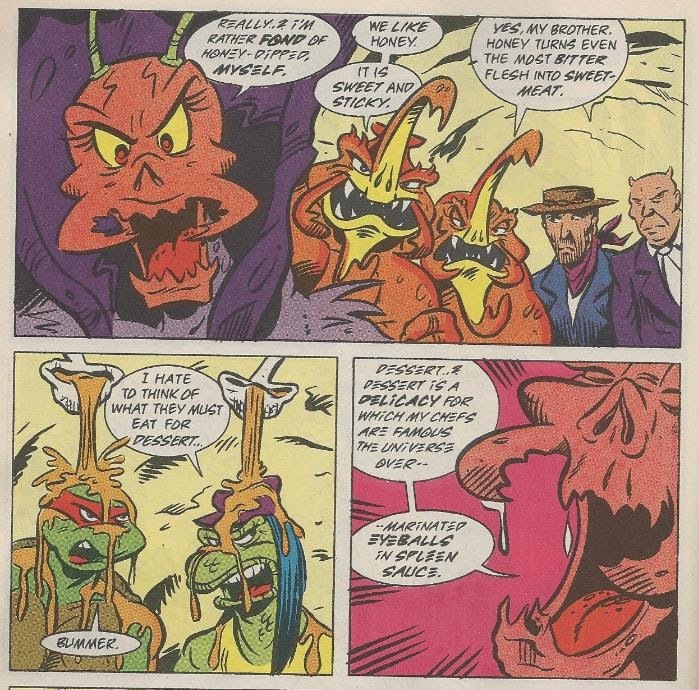 The Mutanimals’ story continues in Mighty Mutanimals (on-going) #1. Raph’s story continues in TMNT Adventures #22. *Kid Terra killed Bubbla the Glublub in TMNT Adventures #16. *Queen Maligna will return in TMNT Adventures #57. *Null will return in Mighty Mutanimals (on-going) #3. *Scul and Bean will return in TMNT Adventures #54. *Stump and Sling will appear again in TMNT Adventures #35, in the back-up story "Mah Name!". *Cudley will return in "Pig Heaven, Part 2". *This issue also featured pin-ups of Cudley the Cowlick and Leatherhead by Stephen R. Bissette. And so this story arc comes to as epic a conclusion as you could expect. This arc wasn’t perfect by any means, but despite a somewhat hasty conclusion I’d say that it lived up to my expectations. The seeds for this adventure had been laid as far back as TMNT Adventures #12, with pretty much every issue after that taking us one more step toward this end. The build-up was slow and, at times, infuriating (the South American tour arc comes to mind), but the sheer volume of action packed into these past few issues made up for the number of pages spent on public service announcements. As a matter of fact, this issue alone features 30 uninterrupted pages of story with no advertisements to speak of. As far as this issue's shortcomings are concerned, my major complaint lies in the aforementioned hasty conclusion. It seemed like Clarrain (Murphy) had kind of written himself into a corner, with the Mutanimals facing some pretty insurmountable odds. The entire alien armada being defeated by simply shooting one of Maligna’s antennae off couldn’t have been more anticlimactic. While the action in this issue was a lot of fun, the overall resolution left something to be desired. Still, even with the antagonists being defeated by a glorified “off” switch, there’s enough positive qualities about this story to keep it above water. Kid Terra really deserves more acclaim than he receives, as his character undergoes a great evolution throughout these past few stories. The scene in which he begs forgiveness from an unflinching Man Ray is nicely dark and somber, while the second-to-last page of the book shows every hero happily celebrating their victory save Terra, who stands quietly alone in the background. Kid Terra will continue to atone for his past sins in the on-going Mutanimals book, making his character one of the more engaging elements of the title. All in all, this was a fine climax even with the quick-fix ending. 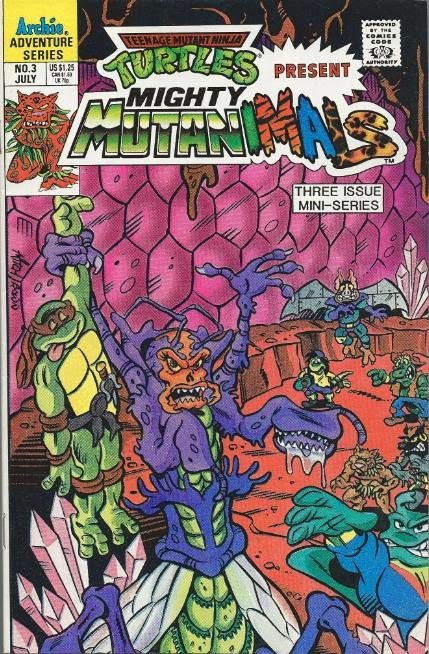 Plenty of threads are left open in order to give the Mighty Mutanimals' on-going title something to work with, while simultaneously sewing up the dangling plot elements from TMNT Adventures.